The 51 MCU SCM is widely available via different channels. It typically comes without a microcontroller, but has a 11.0592 Mhz crystal. 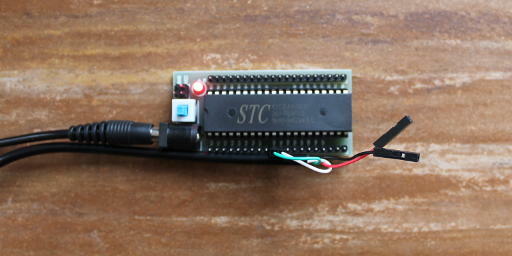 The tutorial uses an STC12C5A60S2 on the 51 MCU SCM. Since the internal oscillator of the STC12C5A60S2 is not very accurate, the crystal is quite useful, even for this tutorial. This short tutorial is about serial output. The author used a Debian GNU/Linux system, but the tutorial should work for other Linux distributions, *BSD or other Unices. The 51 MCU SCM has a STC12C5A60S2. Power is supplied via the power connector (which allows easy power-cycling using the switch on the 51 MCU SCM, which would not be possible when using the GND/VCC pin header), to write the program onto the µC and for serial output a Hobby Components HCCABL0015 serial interface cable is connected (green to P30, white to P31).